I knew my birthing time was coming for days but was never sure exactly when it would start. This was my first pregnancy of four without a membrane sweep. In the early hours of the 15th, I wasn’t sleeping well. Uncomfortable and crampy. By 6 am I was noticing they seemed like more than false waves and figured it was likely the day, so I gave my mom the heads up that she didn’t need to go into work (she was coming to our home to help with the older kids). At 7:30 am, my husband and kids were awake. I sent them down for breakfast and was chatting with my doula via text. Everything felt very scattered still and I needed to relax and see how things progressed. I lit my birthing candle, shut the curtains and started my hypnosis tracks. I went right to Easy First Stage track (Hypnobabies main birthing track) and ended up using it on repeat. By 10:30 am I had peed a few times and could tell based on the number of pressure waves (Hypnobabies word for contractions)/track loop that they were about 10 minutes apart. 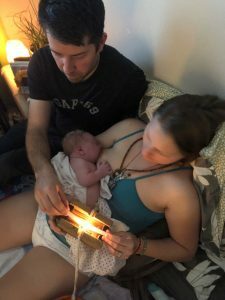 At that point, I asked my doula to come as things were getting stronger. Once she arrived, I was able to sink in. Let go of the “thinking” and go deeper. This was our first home birth, so I was conflicted about the timing of letting people know what was going on (doula/midwives/setting the pool up!). 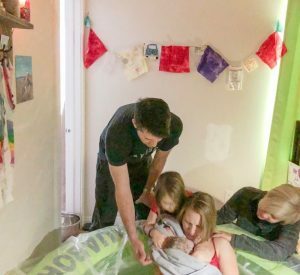 My husband and doula took over all those details and things moved quickly. They started filling the pool. My eldest just turned 5, was in and out of the room quietly asking questions and getting excited. Being in Center (Hypnobabies technique for being in hypnosis but able to move around) was perfection. I was able to go deep during waves but be present as much as I wanted between. I am one of those mamas who didn’t ask my husband or doula to go through any Hypnobabies prep work. My doula is very pro undisturbed birth and my husband just knows what I need. According to the notes (midwife), it was around 1:30 pm when I asked to get in the water. It was an incredibly strong wave and I just knew it was time. Pretty sure I said “water time” too. Instant relief! As it was for my last two births! This ended up being transformation (Hypnobabies word for transition). I had one or two very strong waves in the water and then hit the rest phase. At this point the midwives were arriving. I’m told it looked like I had no waves for a long period, but I know I had three waves. I had flipped to the Pushing Baby Out track (Hypnobabies special hypnosis track for comfortable pushing) (spoiler alert – it is the BEST track of the entire program) and once again Kerry (voice on the tracks) said something that settled me down (this happened in my previous Hypnobabies birth as well although I don’t recall what it was this time). I rode three strong waves without a soul knowing it (because they told me they didn’t think I had any after the fact!). Then things got real. Two very strong waves came, pushing my water sack out. This happened in my last birth too. I could feel my pelvis shifting with the waves, but it wasn’t painful. It was pressure. So much pressure. On the next wave the head descended, hard, fast and out all at once. In four births, I never felt my body push that hard. It was all my body. And I was loud! 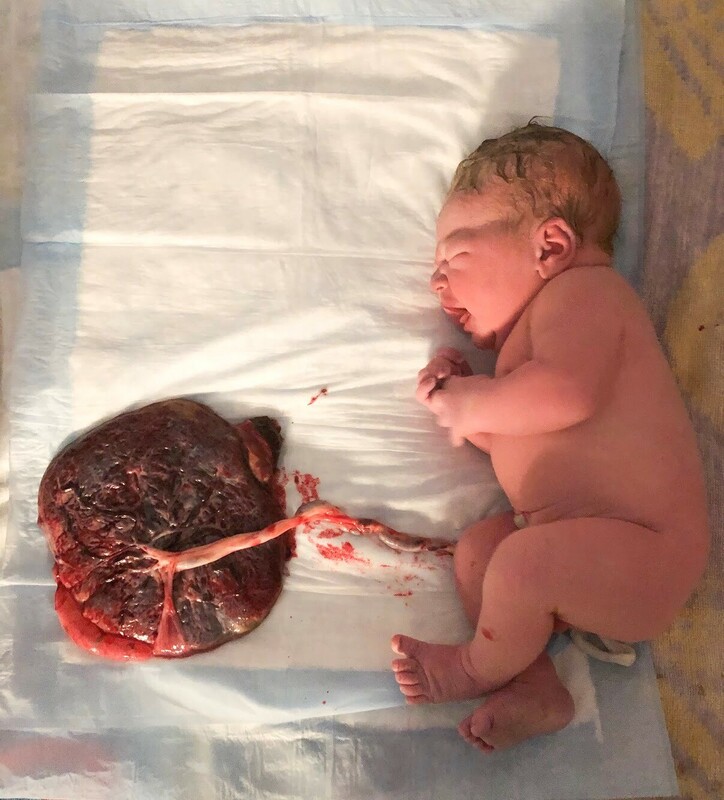 And baby was en caul (born in the amniotic sac)! I felt the body turn and after a 2-minute pause, my body pushed the body out, slowly and gently, en caul until the waist. I caught him with my own two hands and brought him to my chest. I know so many doubt the program. Or feel like they are failing if they don’t do it exactly. And I’m not promoting doing it otherwise! BUT this program is all about trusting our bodies and babies. I think trusting yourself to know what you need out of the program is also super important. I believe I did what I needed. And it worked. I felt pressure. And separation. And movement. And it was incredible. Don’t fear the power of your body. Embrace it. Trust the process of the program and your intuition.